BRIDGEPORT VERTICAL MILLING MACHINE, VAR SPEED, 1.5 HP, 9 X 42 TABLE, P.F. TABLE. BRIDGEPORT EZ TRAK CNC KNEE MILL, 3 AXIS, CHROME WAYS 11 X 58 TABLE, WITH EZ TRAK SX-II CONTROL, S/N EZ2-136. HONDEN HD1550, 15 X 50 ENGINE LATHE, WITH DIAL INDICATOR, 25 –2000 RPM, 3 JAW CHUCK. CLAUSING COLCHESTOR 15 X 50 ENGINE LATHE, WITH DIAL INDICATOR, 25 – 2000 RPM, 6 JAW CHUCK LARGE SELECTION OF CT-40 TOOL HOLDERS. 2008 AKIRA SEIKI SV-550 CNC VMC, WITH MI64J CONTROL, CT-40, 20 ATC, SIDE MOUNT TOOL CHANGER, S/N SV05080003. 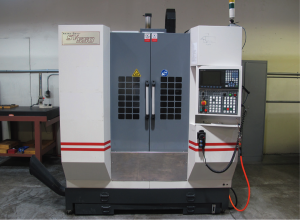 2008 YANG SL-200 CNC LATHE, WITH FANUC Oi-MATE TC CONTROL TOOL SETTER, TAILSTOCK, 10 POSITION TURRET, 8’’ CHUCK, S/N C10697. SEILO MACH 3 CNC HMC, W FANUC O-M CONTROL, 12’’ PALLETS, 20 ATC CT-40, CHIP CONVEYOR, S/N 4K41200105. 2006 YANG BMV-1060 CNC VMC, W/ FANUC Oi-MC CONTROL, SIDE MOUNT TOOL CHANGER, 24 ATC, CT-40, CHIP CONVEYOR, S/N B10003. 2002 AKIRA SEIKI PERFORMA V-2 CNC VMC, MITSUBISHI CONTROL, 22 ATC, CT-40, MODEL V-2C, S/N 02VE265-574. 2010 TURN PRO HORIZONTAL 7’’ BAND SAW. LARGE SELECTION OF VISES, ROTARY TABLES AND SUPPORT TOOLS. KAESER ROTARY AIR COMPRESSOR MODEL SX-6 WITH TANK. LARGE SELECTION OF VISES, INSPECTION TOOLS, RACKS, WORK BENCHES, MACHINE TOOLING, SUPPORT TOOLS AND ETC.